After purchase, carefully empty seed potato contents into shallow boxes or trays; egg boxes or apple trays are ideal. Keep awayfrom frost and store in a cool area. sprout, making sure that the potatoes are rose eye upwards. The potatoes will turn green when exposed to the light but do not worry as this is normal. If you wish to grow large potatoes you can carefully cut out some of the eyes on the potatoes so that only a few chits are formed and the potato will produce larger but fewer tubers. If you wish to grow many small tubers to eat like baby potatoes then leave all the eyes intact and plant the potatoes at half the distances. With the use of a garden fork simply turn the soil over and work in some well-rotted manure to provide essential nutrients for your potatoes. 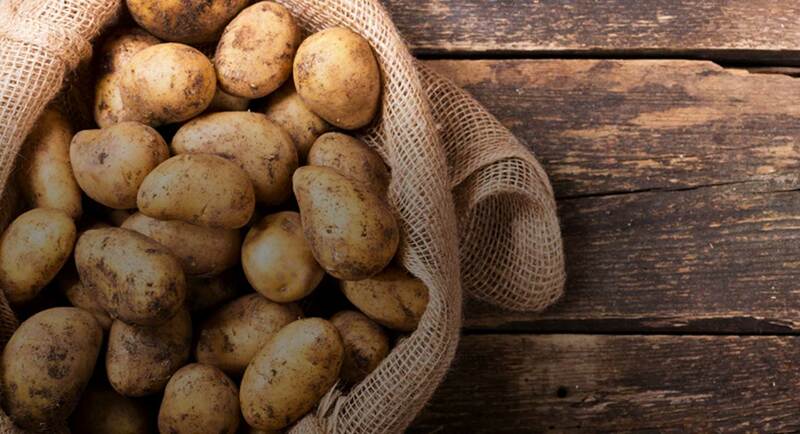 If you are unable to use manure then specialised potato fertiliser can be used but the fertiliser should be placed below the potato and a layer of soil or compost put in between so that thepotato roots grow down into the soil to establish properly. The potato bed should be a trench about 4-6 inches deep and you place the potato in the trench and cover with soil so that a small peak is formed. Shop Now. You cannot beat the taste of growing your own. 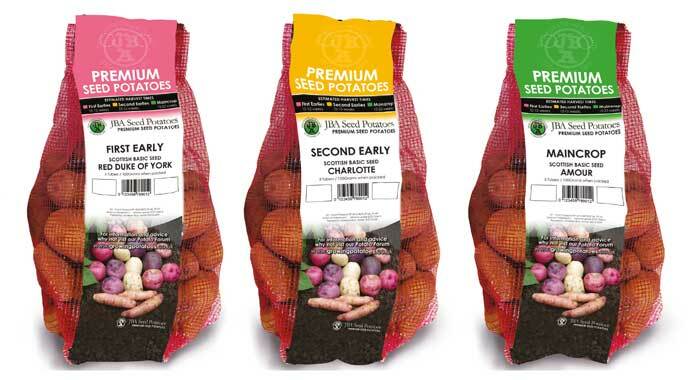 Buy Our Seed potatoes for growing your own potatoes. We have first early, second early and maincrop varieties. Buy Any Three for €10. Nationwide Delivery In Ireland. The normal time to plant potatoes is mid-late March dependent on weather conditions. Dig a trench 6 inches deep and the width of your shovel. Sprinkle 2oz of your potato fertiliser for each metre length of your trench, again gently fork the fertiliser into the soil. If you have problems with slugs now would be the time to add slug pellets to the trench following the recommended dosage or in July/August use nemaslug which are nematodes designed to attack slugs and stop the problem. First Earlies should be planted 10” apart along your drill and the space between drills should be around 24”. Second Earlies and Maincrops can be planted 15” apart with a space of 28” between the drills. Use the soil that you had already taken out of the trench and carefully scatter it on top of the potatoes until the trench is once again flat. Once they start to grow through you should then start to earth up. Earthing up is best done with a garden hoe. The aim is to form a peaked ridge with the loose soil at the edge of the trench to prevent your potatoes turning green which would make them inedible. This might be required 2/3 times a season. NOTE: Always make sure the eyes are facing upwards and planted at a depth of between 4-6” (10-15cm). 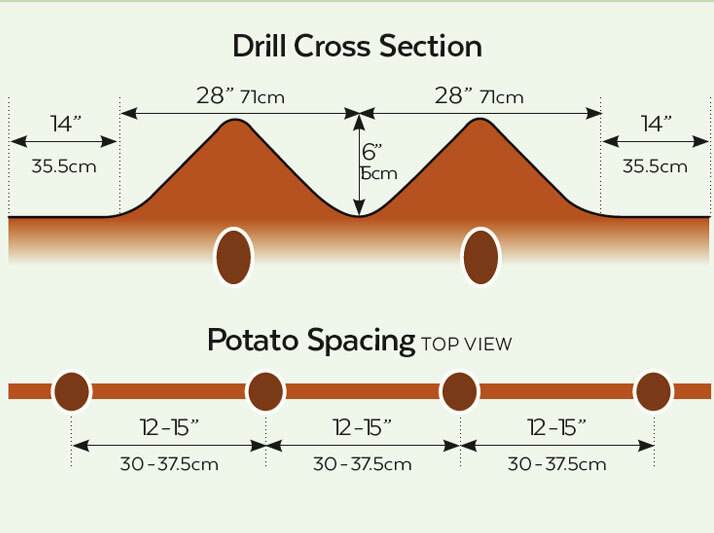 Your potatoes should be planted in drills that are 28” (70cm) apart in each row. 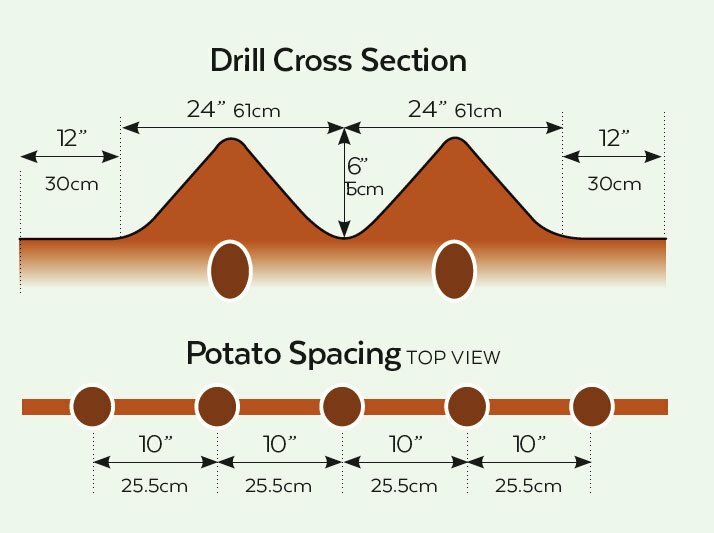 The potatoes should be planted 12-15”(30 -37.5cm) apart from each other in your drills. Harvest once you see the haulms start to turn yellow and die back. Lift the potatoes with a special potato fork so that you do not spear the potatoes. Some varieties, but not all, produce flowers and this is only an indication that they are producing tubers. Earlies should be harvested andused fresh for that new potato taste where as Maincrops can be stored for later use. that you use Maincrop varieties and the haulms should be cut off at least a week before harvest, allowing the skins to set and increase the storage life of your crop. If you are growing in polypots, simply cut the haulms off and place the polypot into a cool dark place so that you access them at your leisure. Make sure the compost mix in the polypot is dry before you store them.